Joan Miró. Tapís de la Fundació, 1979. 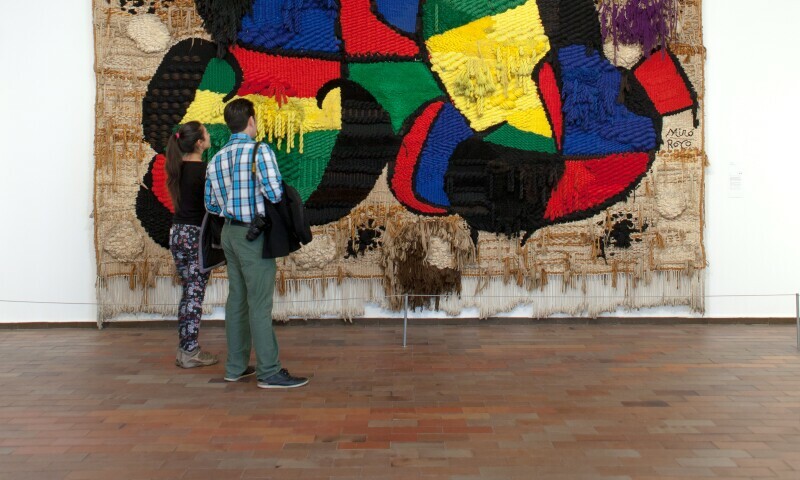 The Tapestry is an iconic work of the Fundació Joan Miró’s Collection, being one of five monumental tapestries produced by Miró during the seventies in collaboration with the textile craftsman Josep Royo. Since its extraordinary proportions demand a very specific location, the work has never been moved and has remained on permanent display since its installation in 1979. During this time, the Foundation’s Restoration Department has worked continuously on its conservation. Until now, however, it has only been the front of the work that has been addressed. Among other considerations, this has been due to the difficulty of accessing the back. After forty years, it is now necessary to act on the back of the Tapestry, an exceptional operation that calls for a specific project by the team of the Foundation in collaboration with Majestic Hotel & Spa Barcelona. The restoration of the Tapestry will also fulfil one of Miró's express wishes regarding the contemplation of this work. Once the restoration that will be carried out in situ is finished, visitors will be able to observe the back and move around it as if it were a sculptural object. This three-dimensional temporary presentation will allow us to experience the material dimension of a work of these characteristics and to travel, as the artist wanted, beyond painting.